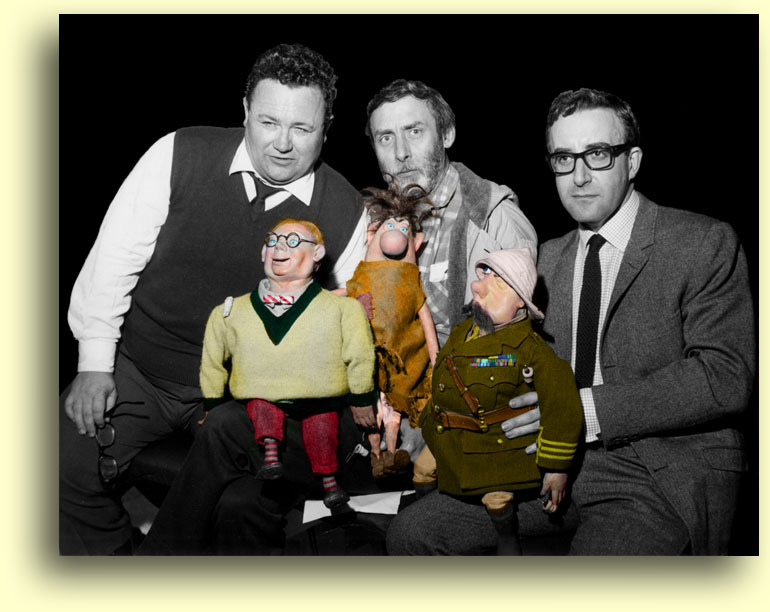 Several years after the radio Goon Show ended, the Goons were reinvented as a troupe of innovative television puppets called The Telegoons. Bluebottle, who was always the most popular Goon, is seen above in his quarter life-size television string puppet version. Click the eBay logo below to search for Telegoons-related items! eBay logo is a registered trademark of Ebay, Inc.
the Goons, during a pause in The Telegoons voice recording sessions, 1963. L to R: Neddie Seagoon (Sir Harry Secombe), Eccles (Spike Milligan K.B.E., sometimes also known as Spike Milligna, the well-known typing error), and Major Dennis Bloodnok (Peter Sellers). 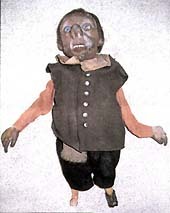 The hilarious Goons injected a new dimension into BBC radio humour during the 1950s, but came together once again in 1963 to provide the voices for a series of twenty-six puppet Goon shows lasting fifteen minutes each. The BBC is believed to have bought the British rights for more than £150,000. The last regularly broadcast radio Goon show was in 1959. This website is proud to be affiliated with the Goon Show Preservation Society of Great Britain. Memberships are available. Please visit the main GSPS website here. 1st FEB 2007: Postscript to the 9th JUL 2006 site log entry: Recently a DVD production company contacted me to say that they are in negotiations with the BBC for the right to transfer The Telegoons to DVD! This sounds like great news, but in the absence of any known whereabouts of Wendy Danielli, who just may be the last surviving shareholder in the (now defunct) Grosvenor Films Ltd., the BBC is stuck in one of its characteristic rights management quandaries. So, if anyone knows Wendy's whereabouts, please don't keep it to yourself, by dropping me a line at aroxburgh@ieee.org. 9th JUL 2006: Greetings dear visitor. Contrary to appearances over the past year, The Telegoons website has not been forgotten. Having recently completed one of the busiest periods of my life, I am once again able to contemplate ways in which the website can be improved. Over the next year I hope to be able to do far more than just keep the site log up-to-date. Indeed, I have a lot of "new" and rare Telegoons-related material that still needs to see the light of day, and which will help bolster the literary, comedic, and historical significance of The Telegoons. Somewhere on the website I discuss a tragedy concerning Spike Milligan and the BBC's audience research department. Due to the fact that The Telegoons was originally aimed at an adult audience, the Beeb's audience research department polled parents, totally ignoring their children, who were the show's real audience, albeit unintended, and who were the only ones who really loved it. The BBC's programme department unfortunately presented a dismal view of the series to Spike. The fact that Spike did not find out about his audience of young Telegoons fans until he was getting too old to care what the BBC did or didn't do with his scripts, is the real tragedy of the matter. In Spike's final years, Maxine Ventham, former secretary of the Goon Show Preservation Society (GSPS) and founder of the Peter Sellers Appreciation Society (PSAS) had a conversation or two with him about this. 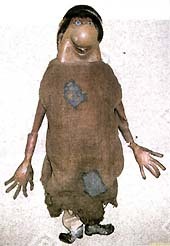 Based on Maxine's correspondence with me on this topic, clearly I'm not the only one who would have liked to have taken Spike back to that distant time and those places (the school grounds of England and the Commonwealth in 1963 and 1964) to see for himself that the Goon puppets were in fact a huge hit. In a 2004 conversation I had about this with Spike's daughter Jane, her parting words were, "We really must get The Telegoons back on television." The Telegoons series was simply ahead of its time. While the adult audience it was intended for ignored it, unbeknownst to the BBC, the series' former audience is now adult and is now (more than) ready for it, waiting for its second run. So please play it again, BBC. One of my goals this year is to present this perspective to the BBC, together with all of the names and comments on the BBC Telegoons petition (see green button, above). 2nd FEB 2006: Out of the blue, I heard from Telegoons assistant film editor, Jim Elderton. Jim now lives in Canada where he works as a film producer, director, and cameraman, producing his own films. 31st DEC 2005: One of the biggest news events of 2005 was the surprise revelation that three of The Telegoons string puppets are alive and well on the Isle of Wight! And now that a series of behind-the-scenes negotiations between their owner and the Goon Show Preservation Society (GSPS) have been completed (in which the GSPS wasn't able to buy the puppets), I am pleased to be able to tell you about their discovery. I said "alive and well", but the puppets are showing their age, and to be utterly frank, although still "alive" are none too "well", as the following photographs attest. 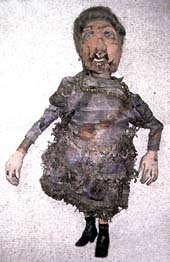 These newly discovered Eccles, Bluebottle, and Minnie Bannister string puppets, like the Ned Seagoon rod puppet before them, are suffering from hardening and disintegration of the foam latex material that makes up their faces, hands and arms, etc. Fortunately they are have all of their original clothing, and Minnie's elaborate hair-do is still intact. Incredibly, she is still wearing her original pearl and gemstone necklace. Unfortunately the email address I have for the present owner of these historically important puppets is no longer valid, so if she would like to contact me confidentially at aroxburgh@ieee.org, I would like to propose that a section of this website be turned over to these puppets so that they may promote themselves to help build interest for possible future auction. 1st AUG 2005: The Telegoons website has just undergone its first big makeover in several years. All of the FAQs to do with people have now been moved to their own section. New material has been added; just look for the "NEW" tags. Perhaps the biggest news is that the petition to the BBC has collected over 1,000 signatures. I hope to submit it to the BBC and Network soon. After submission the petition will be kept going, and will again be resubmitted when it gets to over 3,000 signatures (the petition is accessible from the menu page on the site). 9th MAY 2005: Longtime Goon Show Preservation Society (GSPS) chairman Bill Horsman (who due to his profession and hobbies was a.k.a. as the Steam Count, a handle bestowed on him early on by former GSPS newsletter editor, Chris Smith) finally ran out of steam, and passed away today. Bill was well known for frequently renting The Telegoons films and presenting them to the assembled NE GSPS throng, and when the film rental company went out of business, purchasing all 26 of the films, all of them 16 mm, which were later donated to the GSPS archive. Bill will long be remembered for his wry sense of humour, and for travelling the length and longrh of the country in 1999 to join the Sussex Mod in attempting to (in Goonish fashion) set the English channel on fire. He also joined them in trying to locate various Goon landmarks in southern England. More recently, Bill took part in a very entertaining "Goon Show" specially writted for the GSPS's weekend convention in Egham, July 2003. (Since attending said convention, I have a tendency to write writted, rather than written ;-). 1st AUG 2005: One of the Goons' greatest and most ardent fans, Bill Nunn, passed away today after an extended period of ill health. Recognizing early on the importance of The Telegoons in the Goon scheme of things, Bill was instrumental in helping get this website off the ground. A Goon Show Preservation Society (GSPS) core member, he served as treasurer for many years. 6th MAR 2005: I am very pleased to announce the long-promised Goon/Telegoon map of London. To see it, just mosey on over to the FAQ section of the website, and click on "Where on earth did the Goons & Telegoons stuff take place?" The map is slightly incomplete in respect of the Albert Hall and the Houses of Parliament. These will be added once I have found a way to fit them in. event in Egham, Surrey, 4th - 6th July 2003 was enjoyed by all who attended. Other news: After a long hiatus due to time pressure from other projects, some updates have been made to The Telegoons website. The most obvious of these is a new introductory section called "What what what what...". Although actually uploaded last May, it was incorrectly linked. This has now been corrected. My apologies if you tried to access it and found something else! I need your help in locating Telegoons ephemera (old newspaper articles, magazine articles, films, toys, etc.) If you come across any such items (perhaps lagging the hot water pipes, or lining the old winter overcoat), I would be very pleased to receive them, or even a good photocopy or photograph. Anything would be greatly appreciated! I will gladly cover the cost of postage and any photocopying. Please e-mail me if you find anything that you think I might possibly find useful. All contributions will be acknowledged. Site designed and maintained by Alastair Roxburgh (Kiwi at large). No batter-puddings were harmed in the making of this website. 800 x 600 Hi-Color resolution or more. Note: Mozilla Firefox is not fully compatible with this website. Bigglethwaites' Favourite British Comedy Website for 1999.